Hide N Geek’s shop logo. “Hi Simon. Thanks for taking the time to answer a few questions for me. Let’s start with the most obvious: Why set up in Worcester and not somewhere a bit bigger and busier like Birmingham? Worcester had been crying out for a comic book store for a while and everyone I know was always complaining we didn’t have one. No-one else was doing it so I just thought hey why not and Birmingham already has Forbidden Planet and Nostalgia & Comics. One thing I love about your shop is how tidy and ordered it is compared to some larger, more cluttered shops of this ilk. However, some might initially perceive this to be due to a lack of stock. What would you say to anyone who can’t see what they’re looking for on your shelves? I actually have quite a substantial stock holding considering that I’ve only been trading just over six months. I actually had to do a bit of internal remodelling recently just so that I could display everything. I’m expanding all the time. I can also get hold of pretty much anything as long as it’s available somewhere. I take great pride in hunting down those rare and hard to find items for people. The look of joy when I actually get something that they’ve been looking for is worth more than all the money in the world. As well as comic books and collectibles, there’s a heavy emphasis on promoting tabletop gaming in Hide N Geek. How have you set up to cater for this particular hobby? We initially ran a indiegogo campaign to get some extra funding to help get tables and chairs. At the same time a friend of mine managed to get a lot of tables and chairs for nothing which we are now using. The money from the indiegogo campaign therefore just went on buying more games. 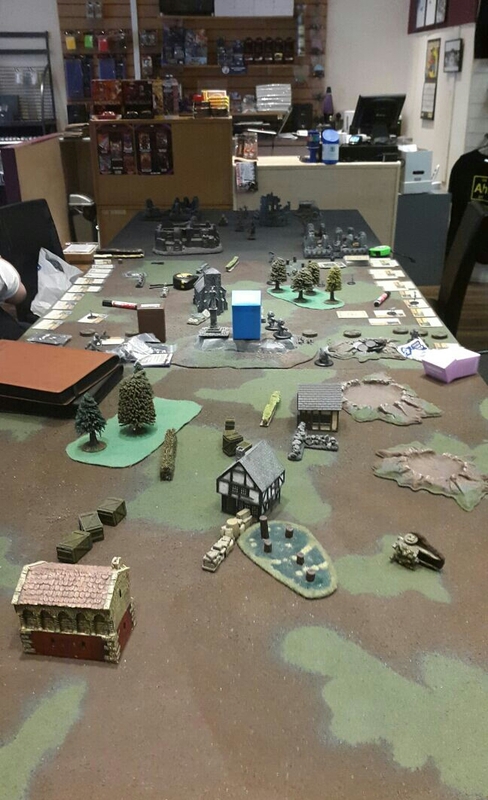 We recently started opening late night Thursdays so that Worcester Wargaming club could use the space, and we’re now running a board game night at the same time which is free to come and play. You can bring your own games or play one of the ones we have. Bring your friends and we’ll get a great gaming community playing regularly. Hide N Geek caters for all types of geek with collectibles, clothing, tabletop gaming, comic books and more. On a more personal note, what are some of your own favourite geek subjects? I started reading Uncanny X-Men when I was 10 and have been mad on superheroes ever since. I watch all the TV shows and the films, and I’m actually starting to struggle to keep up with them all on a weekly basis. Also since opening the shop my love of gaming has been rekindled as people tell me about all the cool games they’re playing. Then I just have to try them for myself! As it’s a topical question in the world of cinema and TV at the moment, which do you prefer: Marvel or DC? If you’d have asked me that a couple of weeks ago I would have said DC, as I love Arrow and the Flash. However now Daredevil has come out I’m really torn as it was just so good. That and Agents of Shield is getting really good with the Inhumans storyline. Collectibles! From DC to Star Wars, and Marvel to Doctor Who, if Simon hasn’t got it on his shelves, he’ll find it for you. I know what you mean! I think overall I just about prefer DC comic books (and collectibles, as you know! ), but I do think Marvel are winning in the cinema and on TV at the moment. Getting back to the shop, how do you feel the first 6 months have gone for you? Anyone that tells you that they have started a business and that the first 6 months aren’t tough would be lying. It has been tough, with more than a few challenges, but I’m getting to somewhere near where I need to be. With the launch of the webstore recently that should help things considerably plus more and more people find me every week. And what hopes and plans do you have for the next 6 months? More stock and more in store events! I have tournaments every weekend and I’d like to expand the games we cover. I want to expand on the range of Wargames that we have in and there have been a few interesting developments that I can’t go in to yet and… I want more comics in! We’ve got close to a thousand back issues now and that’s going to keep growing. I’ve sold some interesting comics in the past few months including some early The Walking Dead issues and New Mutants #98 (which has the first appearance of Deadpool) and over the next few months I know I will be doing more and more of that. 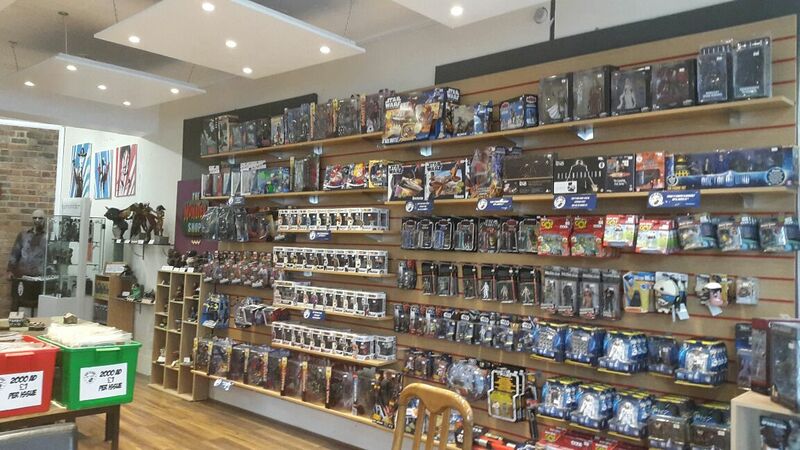 How do you find competition from the other geek-themed shop down the road, and from bigger competitors like Forbidden Planet? I can’t necessarily compete with the big boys on price and range in store so I focus on customer service. I’d like to think that I have less customers now and more friends. I understand that there are other choices out there and that if I want people to come to me I have to do something different, which is why I will go above and beyond for my customers. In terms of Monkee Business down the way [Monkee Business is a shop a few doors down similarly themed around geek culture] I like to think we complement each other. By and large I try not to stock the same things so people can find what they are looking for from one of us and both businesses can thrive. 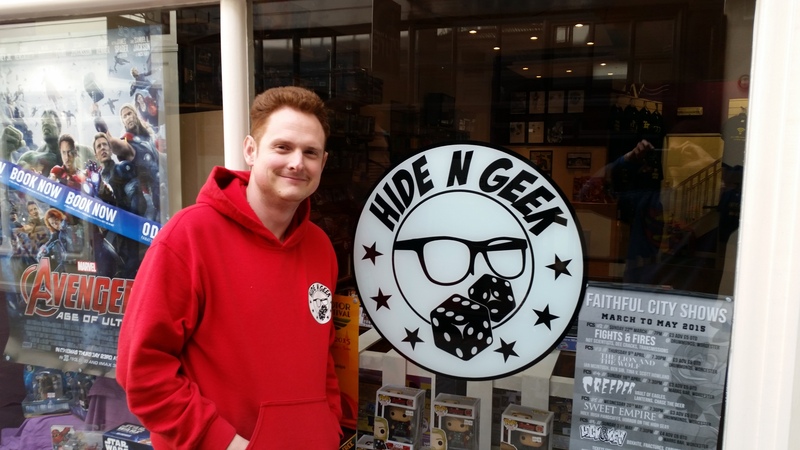 Simon Cooper, Owner of Hide N Geek. As a young local business person, what advice would you offer anyone else looking to set up their own shop or business in Worcester or beyond? Do your market research and do as much of it as possible. You can download tax returns from limited companies in a similar field for a very low cost online to see how much profit they are making as to whether your idea is viable. Take your projections for the first year and divide them by four. If you can’t survive on 25% of what you think you might make then you need to refine your business model. But most importantly never give up; you can make your dreams happen. Finally, is there anything else you would like to add about Worcester’s emerging geek scene or about Hide N Geek? Worcester has a thriving geek community and it can only get better. There seem to be pockets of people with lots of different fandoms. My aim is to bring everyone together in to one geek community. The geek shall inherit the earth!!! Simon is committed to supporting Worcester’s tabletop gaming community. You can check out Hide N Geek on the web at http://www.hidengeek.com, phone the shop on 01905 780570, or email Simon at thehidengeek@gmail.com. 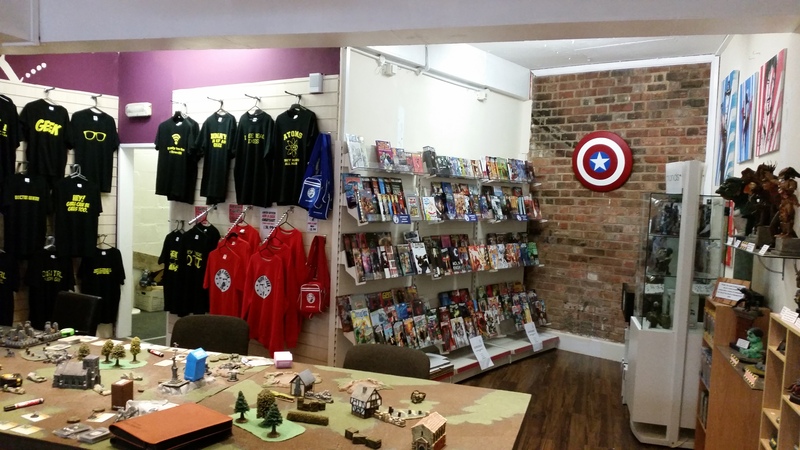 Alternatively get yourself down to Hide N Geek, 10 Reindeer Court, Worcester, WR1 2DS for comic books, collectibles and tabletop gaming events. Cover image from http://www.hidengeek.com and photographs taken with permission by Chris Orr.